Mr B has sensitive skin. 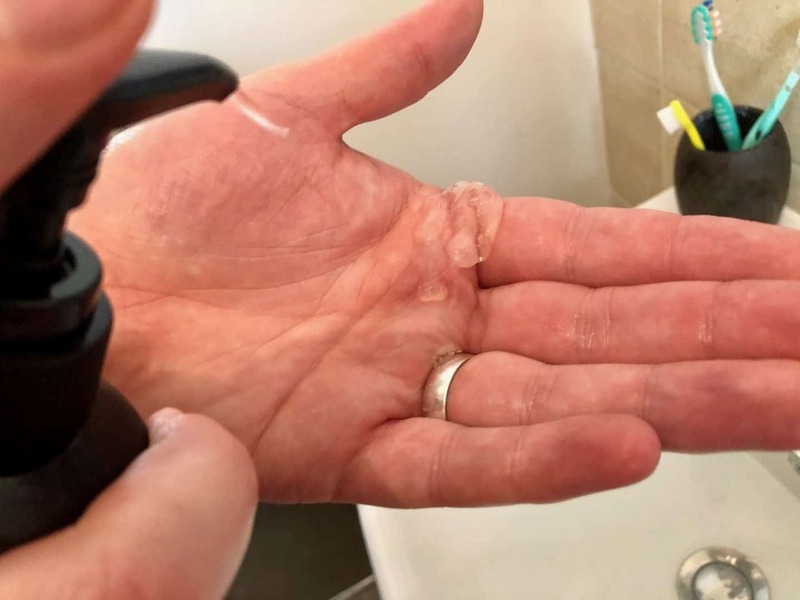 He has tried various shaving foams and gels over the years, but most have seen to cause skin irritation. Plus foams and gels can be quite messy. I was sent this clear shaving gel by Milkman Razor Rail for him to try. Read on to found out how he got on. Also you have the chance to win 1 of 5 bottles for yourself! What is Milkman Razor Rail? So its a clear shaving lubricant for people with sensitive skin. You can use a razor blade or a wet electric shaver to shave with this soap-free gel. The lubricated gel has huge advantages over shaving soaps and creams because you can see what you’re shaving. It moisturises the skin as you shave and saves water as it rinses off the blade easily. It contains no parabens or sulphates. Not tested on animals and is vegan friendly. 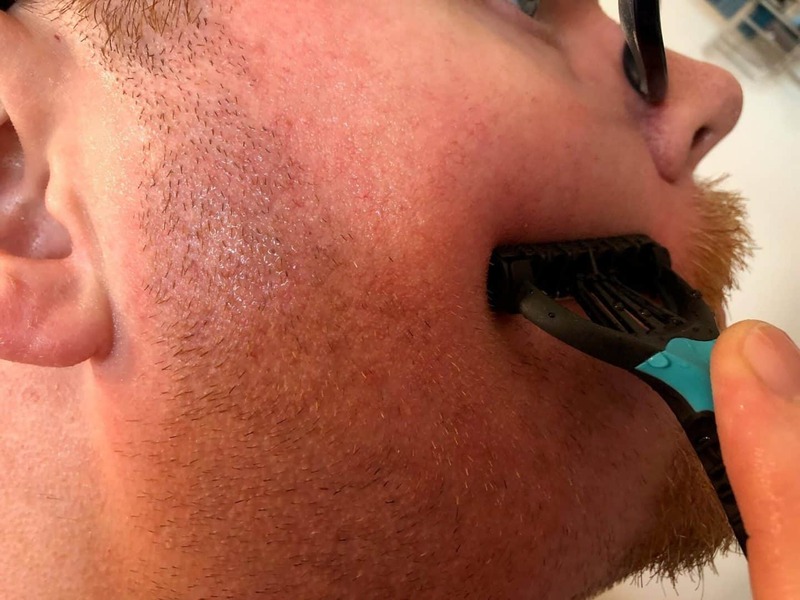 You can get approximately 100 shaves per bottle when using 2 to 3 pumps per shave. Contains Aloe Vera and Menthol to soothe the skin as well as Rosemary oil for its anti-oxidants. The Milkman Razor Rail Clear Shaving Gel comes in a rather large brown bottle with a pump top. You twist the top to open or close the pump. Mr B found the shaving gel easy to apply to the face. 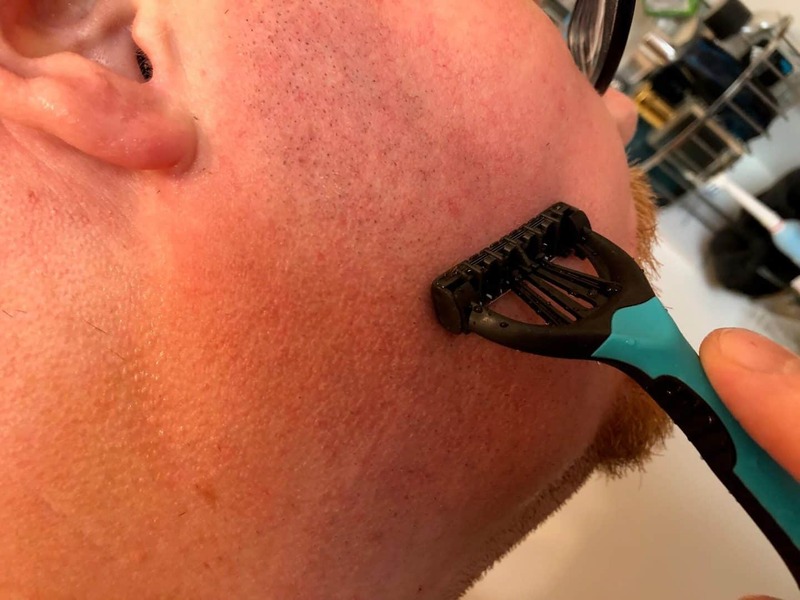 Mr B uses a wet shave razor that with the shaving gel glides over the skin smoothly. He liked how it soothed the skin as he shaved. With no stinging either. It’s got a nice smell that’s not overly strong. One of the good things about the gel is that if you are in a rush you don’t have to prep the skin or moisturise afterwards. The shaving gel does all that for you. 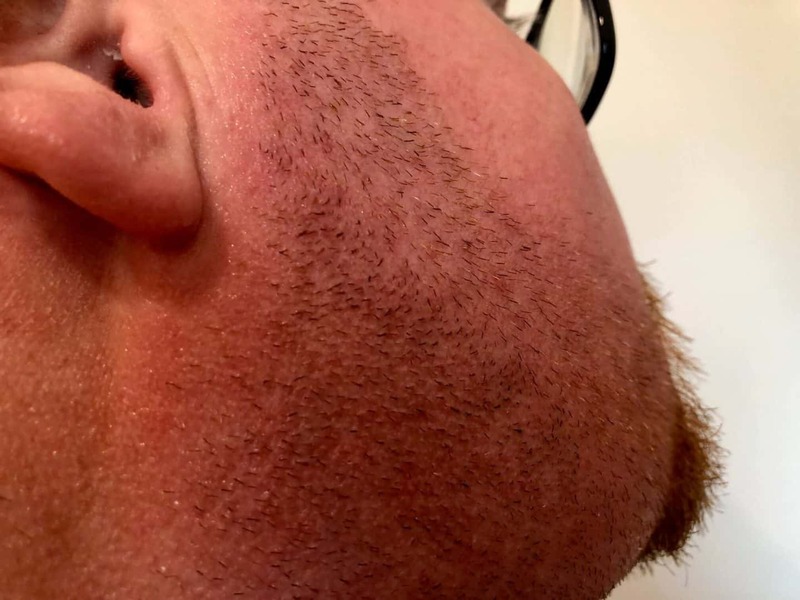 Its advantage is that you can see what you are shaving! We can’t answer the question if there are 100 shaves in the bottle as we haven’t had it long enough to use that amount. But the bottle is rather large so I expect it would get you there. 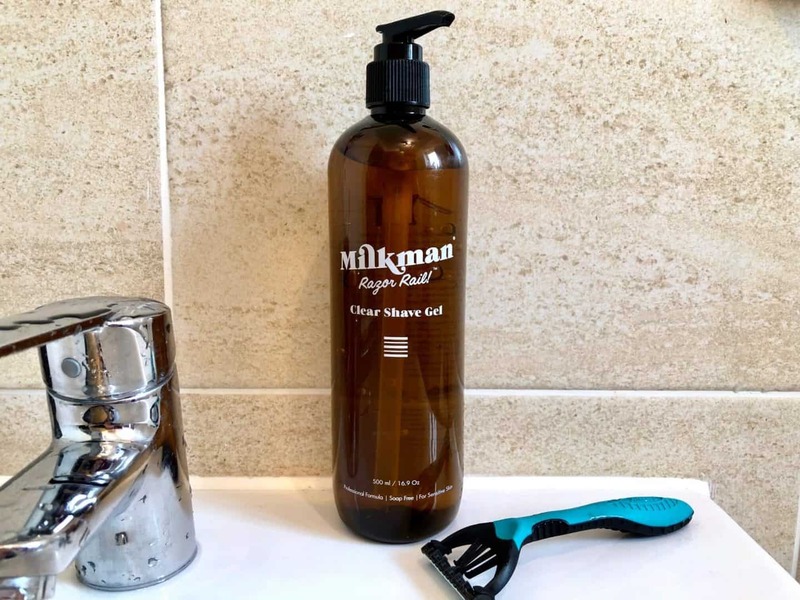 I think Mr B is a convert to this Milkman Razor Rail Clear Shaving Gel, it definitely has helped calm his skin after a shave. T o win 1 of 5 bottles of Milkman Razor Rail Clear Shaving Gel please fill in the gleam widget below. Remember the more entries you complete the netter the chance of winning! *Terms and Conditions – The prizes are non-transferable and no cash alternative will be offered. The winner’s will be selected at random via gleam from all valid entries and be notified by the Review Directory by email within 7 days. Open to all UK entrants aged 18 or over only. Facebook and Twitter are in no way associated with the giveaway’s. Rachel Bustin will not hold any of the entrants details. The giveaway ends on the 7th February 2019. Thank you for the giveaway, I will look into a local retailer for the gel for my partner too!